Where Have You Gone, Mickey Mantle? I'm in a taxi, trying to get to Yankee Stadium. I'm late and I've got my uniform on. But when I get there the guard won't let me in. He doesn't recognize me. So I find this hole in the fence and I'm trying to crawl through it, you know? But I can only get my head in. I can see Billy and White and Yogi and Casey. And I can hear the announcer: "Now batting ... number 7 ... Mickey Mantle." But I can't get through the hole. That's when I wake up. My palms are all sweaty. So goes the introduction to Diane K. Shah's outstanding 1980 New York Magazine profile of the Mick: "Where Have You Gone, Mickey Mantle?" The Mantles' four-bedroom beige house sprawls on an acre of emerald-green lawn in an upper-clan section of North Dallas. Its two wings wrap around a sparkling turquoise swimming pool that looks like it hasn't been used for some time. Merlyn Mantle, a tiny platinum blonde with large blue eyes is in the den talking to Joe Warren, a regional sales manager for Reserve Life, who had dropped by with two box of baseballs for Mantle to autograph. Mutely, Mickey carries the boxes to an easy chair. Balancing the boxes on his knees, he begins scrawling his name. As Warren is speaking, Merlyn turns and says softly to her husband. "Do you want your glasses?" "No," mumbles Mantle in embarrassment, and keeps writlng. Later I am led through a spotless white kitchen to the back of the house, where, stuck on like an appendage, the trophy room is. It is an awesome treasure trove or memorabilia, every square inch of wall crammed with me mementos of Mantle's extraordinary achichievments. Encased behind glass are an enormous sterling tape measure honoring his longest blast, a solid silver bat denoting his American League batting titles, the big, jeweled Hickock Belt for athlete of the year. Trophies that do not fit into the credenza spill out into the far comers of the room. One wall crawls with magazine covers of Mantle. Another holds a framed swatch of the number-7 pinstripe. Throughout Merlyn's tour, Mantle stands impassively in the doorway. He rarely comes into the. room anymore, he says, and seems disinterested in it. "When Mickey first retired," Merlyn says, "I thought it was really great—he'd be home all the time. But he isn't." "The last three months I haven't been home hardly at all," Mantle concedes. "That promotion I did for Cameron Wholesalers? I went to twenty cities all over Texas. 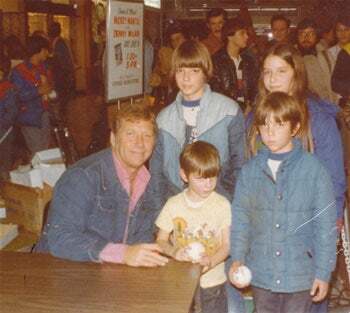 They had this deal called Mickey Mantle Grand Slam Specials. You buy 50 doors and get one free"—he laughs—"or something like that." "Do you enjoy these appearances?" I ask. "No," says Mantle quietly. "It's just a monetary thing. I doesn't do anything for my ego. If somebody gave me $2 million I wouldn't do another one." Then, not wanting to sound ungrateful, he adds. "Really, I don't mind it, though. It makes me feel good that people want me to come."